When Pratt student Richenna King moved from the sunny Philippines to an apartment in Brooklyn to study Industrial Design, she longed for the expansive garden space she had back home. It is a common challenge among city-dwelling gardening enthusiasts to grow their plants in confined living spaces. With the help of her creative partner, Vic Sison, they developed Plantereo, an intelligently designed and easy-to-use self-watering planter made of satin glazed ceramic and glass. By stacking the ceramic pot on top of the glass holder and filling it with water, your plant will sustain itself for up to five days without watering. 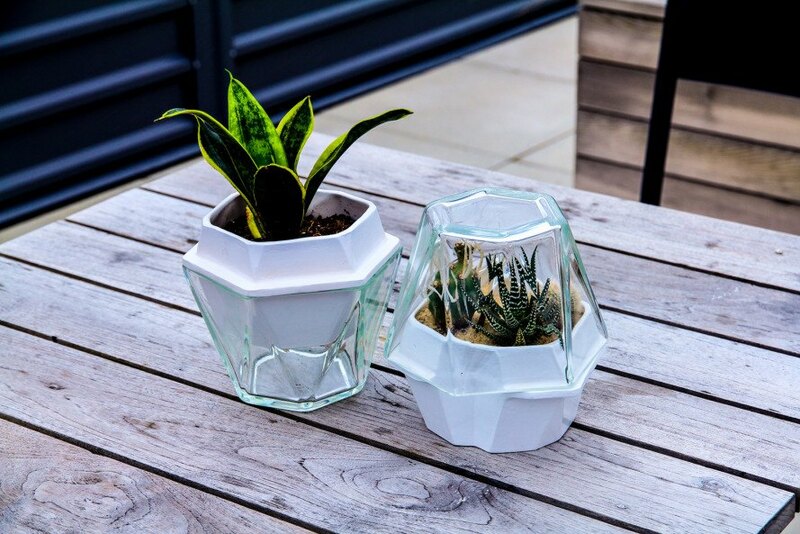 Invert the glass holder onto the ceramic pot, and Plantereo instantly transforms into a warm and humid terrarium — great for sprouting seeds and growing plants like Venus Flytraps and miniature ferns. Plantereo’s crowdfunding campaign is currently live on Kickstarter. When Pratt student Richenna King moved from the sunny Philippines to an apartment in Brooklyn to study Industrial Design, she longed for the expansive garden space she had back home. It is a common challenge among city-dwelling gardening enthusiasts to grow their plants in confined living spaces. With the help of her creative partner, Vic Sison, they developed Plantereo, an intelligently designed and easy-to-use self-watering planter made of satin glazed ceramic and glass. By stacking the ceramic pot on top of the glass holder and filling it with water, your plant will sustain itself for up to five days without watering. Invert the glass holder onto the ceramic pot, and Plantereo instantly transforms into a warm and humid terrarium -- great for sprouting seeds and growing plants like Venus Flytraps and miniature ferns. Plantereo’s crowdfunding campaign is currently live on Kickstarter.